Let’s be honest. 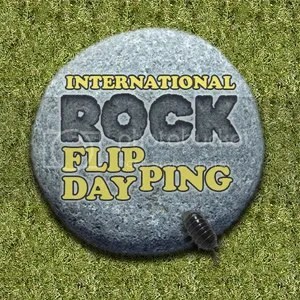 For me, every day is “Rockflipping Day.” But, despite being the last, blistering day of my vacation, I found a few moments on September 2nd to turn a few stones in honor of International Rock Flipping Day. 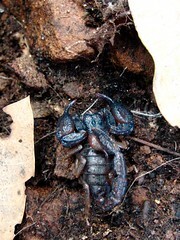 My discoveries were rather pedestrian, no salamanders, no snakes, no scorpions, not even a pseudoscorpion. But, I got a few nice shots nevertheless. First, a bit about the rocks themselves. At left is rock #1, which observant readers will note has a bit of an anthropogenic look to it. The “anthro” in question is my mother, who has taken up stepping stone manufacture lately. 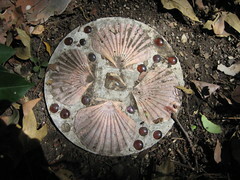 This one consists of four scallop shells, one chunk of chert and sixteen amber glass beads (well, fifteen as one has apparently popped out) set in a round slab of concrete. more established pedigree. 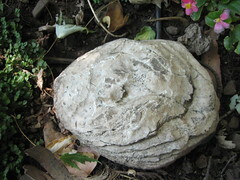 It is a roughly grapefruit-sized fossil oyster, probably Ostrea titan one of the ubiquitous (and consequently very dull) fossils of my childhood. Okay, so this one’s a blatant cheat. Not only is this Pacific Treefrog (Pseudacris regilla) atop the fossil oyster, but I took this photo on Aug. 28th, several days before rock flipping day. But that is the rock I flipped on the 2nd, and there were frogs on and around it then too, so I couldn’t resist. Many other IRF day participants turned up amphibians (check out the flickr pool). 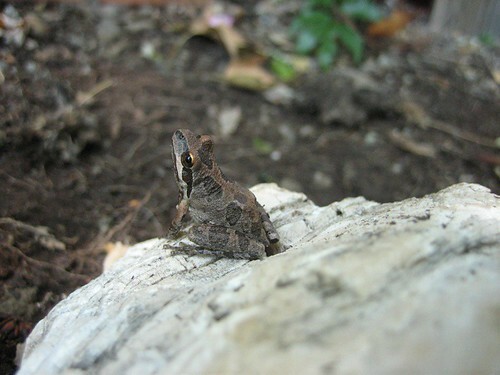 Most amphibians began their life as aquatic larva and, because most need to keep their skins moist in order to survive, the damp undersides of rocks are appealing refugia especially in the heat of a summer day. Here are some other folks with aquatic roots. 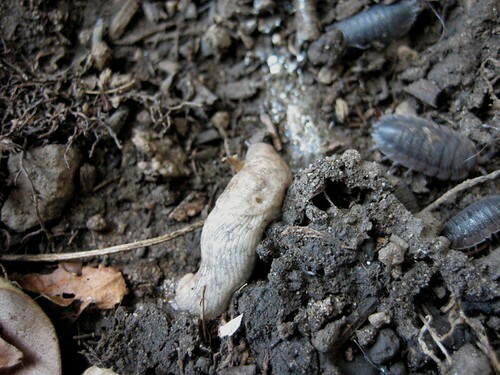 At center is a slug, perhaps the Gray Garden Slug (Deroceras reticulatum). He/she (I’m not hedging here slugs are hermaphrodites) belongs to that predominately marine group of delectable gooey animals the molluscs, same as the giant oyster he/she’s hiding under. Slugs and oysters have followed roughly diametric paths. Oysters bulked up on armor and hunkered down in the ocean perhaps none more so than the massive Ostrea titan. 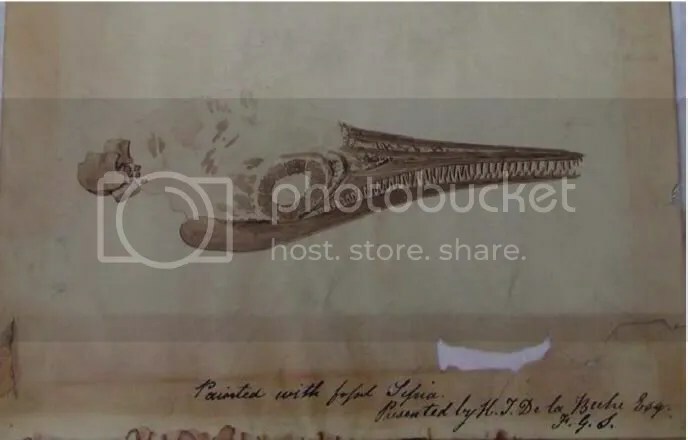 Slugs on the other hand, in a previous incarnation as land snails, set out for shore, grew a lung (the opening to which, known as a pneumostome, is clearly visible in this shot), and reduced the size of their shell until it disappeared altogether. 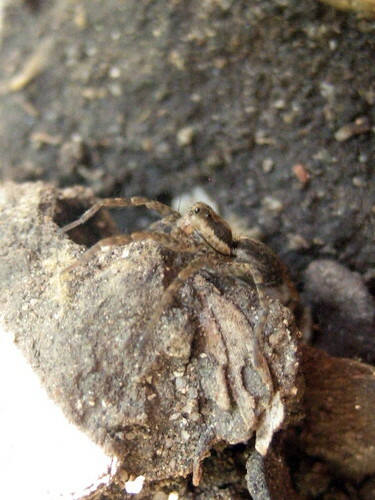 This left them vulnerable to predation and dessication, hence the hiding under the rock in the middle of the day bit. 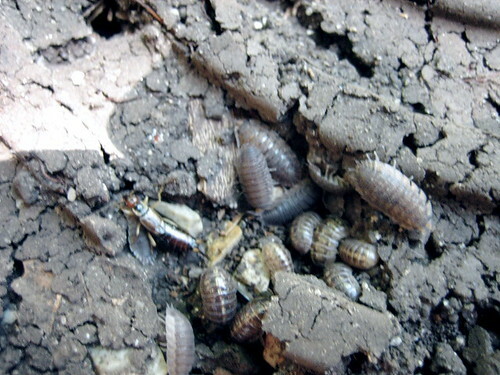 The isopods off to the right (or if you’d rather, rollie-pollies, sowbugs, pillbugs, woodlice etc.) belong to a predominately marine group, the crustaceans. In fact, they still have gills! This makes them one of the most reliable denizens of moist microclimates, logs, underneath rocks, leaf-litter etc. Hence their place of honor on the IRF logo at top. 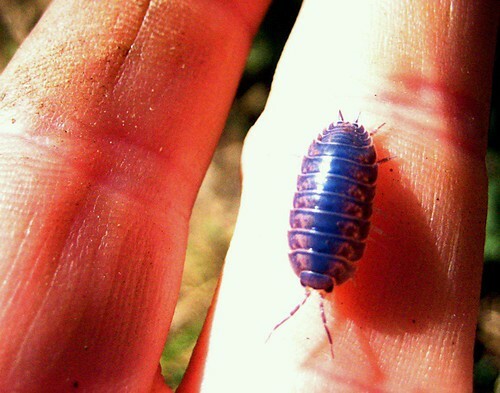 I’ve written more about terrestrial isopods and the bizarre color-changing infection they get in A Passing Glance. 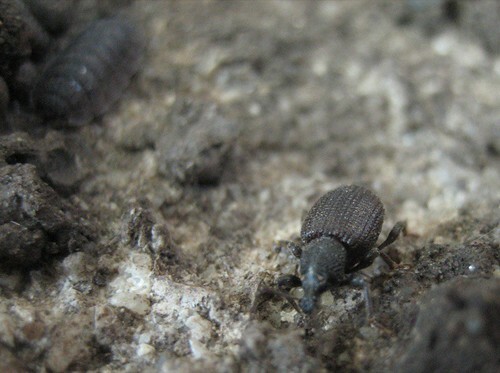 Myriapods, millipedes and centipedes, are today restricted to land although they had some marine relatives in Paleozoic. They are among the oldest groups of land animals and perhaps the first to work out how to extract oxygen from air directly. Nevertheless, perhaps in an effort to avoid predators, they still tend to favor secluded environments especially under rocks and leaf litter. 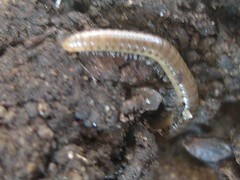 This millipede seemed none-to happy to see me and scuttled off before I could snap a decent picture. Others, like the house centipede, actually venture into buildings and cause great distress. 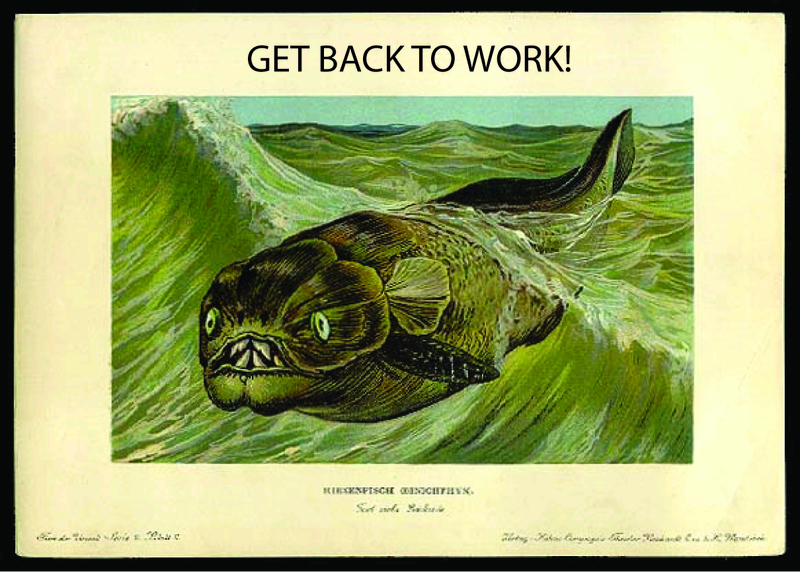 Perhaps just to ge back at the rock-flippers. Distant, uniramian cousins of the myriapods, insects are another decidedly terrestrial group. They’ve been even more bold and successful in their conquest of the land. Even many of the aquatic insects still breathe air, either rising to the surface, trapping bubbles, or growing a snorkel off their back side. This black weevil, probably Otiorhynchus something, might be hiding from predators or it could be recently pupated, laying eggs, or just after my mom’s gardenias. and an earwig pretending to be an isopod. Best of all, was this Grass Spider (Agelenopsis sp.) who scores us one more class of soil invertebrate, an arachind. And everyone knows arachnids are the best. 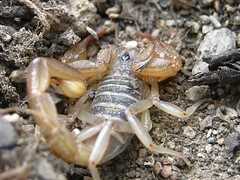 Next year I’m going to the foothills or lava beds or Arizona or somewhere with some guaranteed scorpions! Iridescence is one of those curious optical games that light loves to play. From pearl earrings to tropical butterflies that appear to be made out of cellophane, iridescence is a source of luminous beauty across the natural world. Like most magic however, it has its dark, deadly side too.